This Persistence Market Research (PMR) report examines the global human platelet lysate market for the period 2018–2026. The primary objective of the report is to offer insights into market opportunity for human platelet lysate and pipeline developments in human platelet lysate market. The global human platelet lysate market has seen promising growth in the last decade in the global market, as human platelet lysate has emerged as a boom for cell manufacturing for cell-based therapeutics. Funding for Life Science research and investments in this area serves to expand various projects undertaken and personnel employed. Sources of R&D spending include governments, private funding or commercial organizations. Academic research institutes have focused on advanced basic research, including applied research when government or industrial organizations prefer cost-effective ways to pursue development programs. A majority of basic research continues to be carried out at academia as companies focus on bringing products to the market with an eye towards generating profits. The continuous increase in research centres as government is providing funds/grants and increased demand for new products with lower price represent additional opportunities for the manufacturers of human platelet lysate. The report analyzes the global human platelet lysate market in terms of value (US$ Mn). The report begins with the market definition and explaining different products types and products used to conduct research and development activities. The market view point section includes PMR’s analysis on key trends, drivers, opportunities, trends and macro factors influencing the global market. Opportunity analysis provided in the section allows the client to better equip with crystal clear decision-making insights. Overview on human platelet lysate for clinical use would provide future prospects of the market. Pipeline analysis provided in the subsequent section helps the client to identify future rivals in the global market. Each of these sections analyze regional market by product type, application, end user and country. Regional introductory section provides current scenario of life science and cell therapy provisions in representative countries, clinical and research use, research & development related resources such as number of academic & research institutes, cell therapy service providers, biotechnology companies, market access pathways for new human platelet lysate and current human platelet donation and processing pattern adopted by guidelines. Representative market participants section gives the list of companies operating in every region, competitive landscape and intensity map of their presence in each region. To arrive at the market size, we have used our in-house data-based model to estimate human platelet lysate market size. We have adopt bottom-up approach to forecast the human platelet lysate market globally. Weighted average selling price is considered to estimate the market size of various products mentioned in the scope of the study. The country price is captured with the local currency. The local currency figures is then converted to USD to offer forecasts in a consistent currency standard. Furthermore, PMR has also considered the latest annual exchange rate to reflect the impact of the most recent economic conditions of country. Prices considered in the models are standardized based on the average packaging and types of product. The forecast presented in the report provides total revenue of currently approved human platelet lysate products over 2018–2026. In addition, we have taken into consideration the year-on-year growth to understand the predictability of the market and to identify the right growth opportunities in the global market. In the next section of the report, the ‘Competitive Landscape’ is included to provide report audiences with a dashboard view and to access the key differentiators among the competitor firms. Market structure analysis provides tier-wise breakdown of total market revenue. The section also provides company share analysis and market structure analysis for key market players. The market structure analysis would enable the client to identify their position in the market in comparison to their global peers. This section is primarily designed to provide the client with an objective and detailed comparative assessment of product offerings and strategies of key providers specific to a market segments. Detailed profiles of players in the human platelet lysate market are also provided in the report, which highlights company description, overview, product/segment overview, SWOT analysis, financial information, key developments related to market and strategic overview. Another key feature of this report is the analysis of key segments in terms of absolute dollar opportunity. This is traditionally overlooked while forecasting the market. However, absolute dollar opportunity is critical for assessing the level of opportunity that a provider can look to achieve, as well as to identify potential resources from a sales and delivery perspective of the products. To understand key growth segments, Persistence Market Research provides the ‘Attractiveness Index’ analysis which helps the client to identify real market opportunities. Human platelet lysate (HPL) is a non-animal derived cell culture growth supplement obtained from blood platelets after freezing and thawing. HPL contains abundant growth factors and cytokines necessary for cell growth and proliferation. Platelet lysate can be used as a source of growth factors to replace bovine serum in cell culture medium. Replacing bovine serum with HPL allows expansion and clinical grade production of functional mesenchymal stromal cells by removing the risk of xenogeneic immune reactions and transmission of bovine prion and viral pathogens. The U.S. FDA is moving towards adopting European guidelines requiring that bovine materials be removed from culturing media for any therapeutic product containing cultured cells, thus making HPL an attractive alternative to the production and manufacturing processes. The global human platelet lysate market is segmented by product type, application, end user and geography. 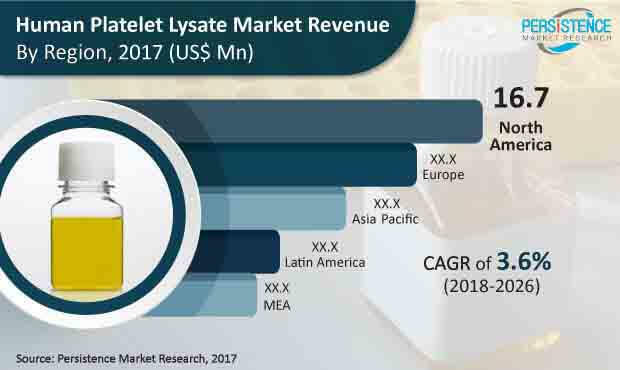 PMR estimates that the global market for human platelet lysate is expected to surpass US$ 61.0 Mn by 2026 end, expanding at an impressive CAGR of 3.6% over 2018–2026. The clinical use segment clearly dominated the global human platelet lysate market, with over 93.5% value share in 2017. The segment is expected to grow at 3.7% CAGR over the forecast period of 2018 – 2026. Matured markets of North America and Europe collectively accounted for 67.5% value share in the global human platelet lysate market in 2017. Emerging economies of Asia Pacific are expected to contribute significantly in the global human platelet lysate market during the forecast period. Academic & research institutes segment holds maximum share as maximum number of research and development activities are performed in academic & research institutes. The increasing popularity of human platelet lysate amongst professionals is expected to be the key growth driver of the human platelet lysate market. Human platelet lysate is a convenient alternative to fetal bovine serum (FBS) as an in-vitro cell culture growth supplement and will be a great benefit in near future for various therapeutic applications. Over the past few years, the market for human platelet lysate has seen tremendous growth due to large donated blood pool in most of the developed countries, which has increased the demand for human platelet lysate. However, potential entrants in this market need to spend a lot of time and resources to understand the needs and specifications of the scientists/researchers and the research process with specific indication to tailor the product and competitive pricing constraints, which are the major factors limiting the growth of global market. Some of the key players identified in the global human platelet lysate market are Merck KGaA, Compass Biomedical Inc., Macopharma SA, Cook Medical (Cook Regentec), Mill Creek Life Sciences Llc., Stemcell Technologies Inc., Zen-Bio, Inc., Sclavo Diagnostics International Srl, Life Science Group Limited, and Trinova Biochem Gmbh, among others. The domestic players are quiet aggressive and also competing with the international players. These companies are looking for opportunities to strengthen their distribution channel in other geographies. Mill Creek Life Sciences Llc.